Handmade striped Pumpkin features autumn inspired colors with a textured Stem. The design boasts beautiful light that provide immense visual appeal. Makes a perfect statement piece of any room, and is a great fit on mantles, shelves, and tables. 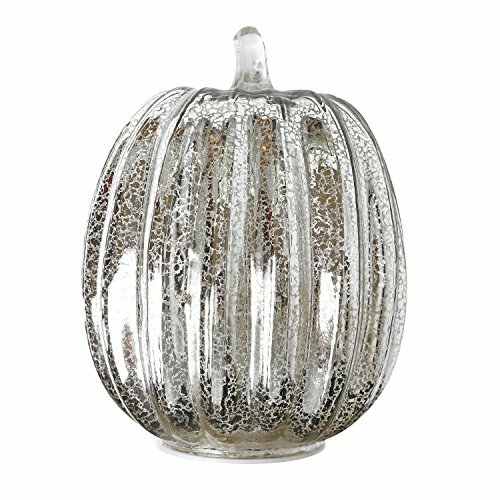 With a beautiful antiqued finish, these gorgeous glass pumpkins will be stunning anywhere in your home. Replace and close the battery compartment lid. ON: Slide the switch to the "ON" position to turn on, the pumpkin light will keep light up. OFF: When toggle the switch to this position, the candle will keep off. Timer: 6 hours lights up. 18 hours off, keep repeating this process. . . The light will remain lighting up for 6 hours, then go out automatically. The next day it will light up and off at the same time the day the timer was set, and repeat this process. To change starting time, cycle the switch to off and back to either 6 hours at the desired time. Creative Pumpkin Design -- Pumpkin measures 7.5 Inches height and 5.5 Inches in diameter. Pack of 1. Made of high quality gorgeous glass, creative design is enough to attract people's attention. Scatter 10 Led Lights -- Inside with 10 LED flickering lights that make the orange glass sparkle, like the stars twinkling. Bright enough to light up your room. Auto-Timer Function -- In-built 6 hours timer function, 6 hours lights up,18 hours off, turn on at the same time on next day automatically and keep repeating this process. ON/OFF/TIMER switch easy to operate. Safe & No Fire Risk -- Each requires 3 AAA batteries (Not Included). You get peace of mind and a whole new world of decorating possibilities. Calming, approachable, seductive and sublime. Also safe for children's rooms decor. Multifunctional Decor -- Perfect accent for fall autumn Halloween Christmas Thanksgiving Rustic decor. Also as home accent decor, best gift choice. If you have any questions about this product by Romingo, contact us by completing and submitting the form below. If you are looking for a specif part number, please include it with your message.